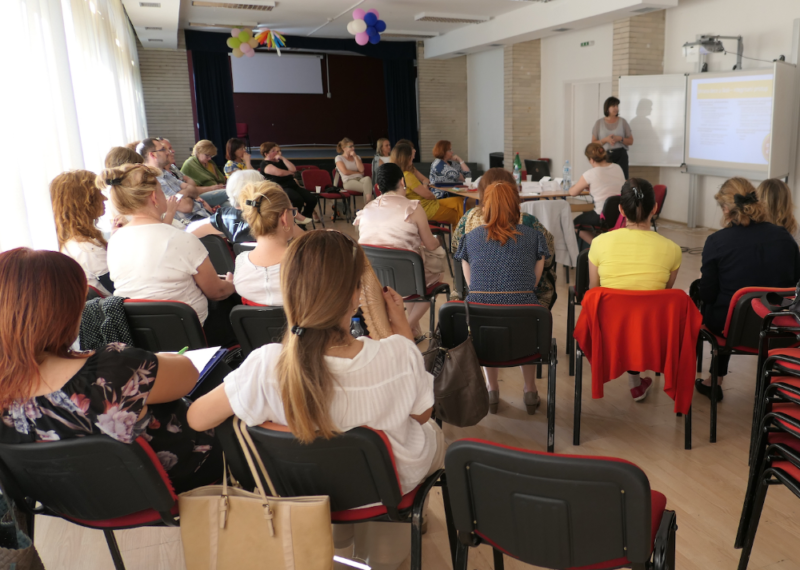 Another date, this time Tuesday, 4th June, and another place, this time Belgrade benefited from another Strength2Food Hybrid Forum in Serbia, and where better to hold it than in one of our schools taking part in the WP9 school meals pilot scheme. Thanks to the school’s director, Jole Bulatović, we had the school’s special events room available from 15:30 until 20:00 last Tuesday. So, while setting up the proceedings we had a few curious children milling around, wondering what all the drinks were for! Another theme, this time for the benefit of our Ministry of Education and Science partner, it was “Developing regulations for standards on the quality of food in primary schools”. A working group within the Ministry was finalising its recommendations and this was the last chance for input from school stakeholders to be taken into consideration. Our second Hybrid Forum attracted 36 participants, and more of our schools would have sent representatives had it not been for the pressure of end of term activities during the first two weeks of June. Nevertheless, 12 of our schools were represented, and participants had travelled from as far as Loznica (150 km), Novi Sad, Valjevo and Mionica to get to the event. The format was as for the previous HF with a round (square) table of key speakers presenting their thoughts on the theme for around 10-15 min, with other participants sitting outside the square, facing a screen, as two of the speakers had PowerPoint™ presentations. The seven key speakers included a representative of the Ministry of Education, an expert in procurement Law, two speakers representing the health services in Valjevo, and one of our school coordinators. Also, of particular relevance for the Ministry’s new regulations was Dr Milka Popović from the Institute of Public Health, Vojvodina. She presented information on the current status of children’s nutrition, which shows a trend for reduction in the intake of essential fats and protein and an increase in carbohydrates, leading to increased childhood obesity. The final key speaker was the director of our host school, who announced that the school now has fruit and vegetables supplied by a producer cooperative, though problems with the low level of interest in the food procurement tender have been a frustration. As before, we had a display of school food for sampling during the break, and it was good to see several school cooks vying to find out who had brought the tastiest offerings. My favourites were the smoothies brought by the chef of a secondary school in Mionica. It is clear that school dinners can be appealing to the eye as well as tasty. Indeed, one school chef from Novi Sad said his children prefer the way he makes some foods to the way the same foods are prepared at home. So it can be done! The general discussion session was lively and continued to the 20:00 end of the HF. As previously, the key role of parents in determining their children’s food habits was raised. Amongst the audience was a representative of the Association of Parents and Teachers, who was very supportive of the project’s work and will be a valuable future ally for us. The school cooks in the audience passed on their experiences and success stories at getting children to eat school meals. A school cook from Novi Sad said he has managed to reduce plate waste to very little in the three years he has been working at the school. This contrasts with findings of the BEL representative who said plate waste, recently analysed in four Belgrade schools, was a major problem. Although invited media representatives were not present for the HF, from follow-up media contacts, two interviews for Serbia’s main domestic TV station, RTS have since taken place; one for the daily Belgrade Chronicle programme. The second interview is for a forthcoming weekly educational programme “All colours of life”. So, another success story for Strength2Food.